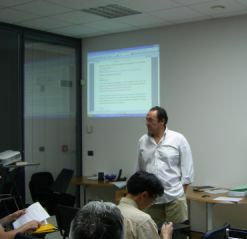 Bioagricert srl organized a training program for international inspectors on July 2-6, 2007. The aim of the program was to transfer the basic concepts of international certification systems - organic farming (EC reg. 2092/91-IFOAM-NOP-JAS), HACCP, Hygiene, Traceability, Gap and Eurep Gap, including the role of inspectors for Bioagricert�s inspectors and stakeholders who were interested in quality product certification systems. Two members of the BEAN-QUORUM network participated to the training program activities. Nowadays, European Union consumers need more safety and quality agricultural products, therefore so many standards from farm to table emerged, for instance HACCP, Hygiene, MRL, Codex, Gap and EC reg. 2092/91. As a result, producers and exporters try to guarantee their products in farming, processing, transportation, distribution and retailing, and international inspectors play a key role to give them the chance to sell the certified products to consumers. The training pointed at the significant regulations of each systems and report forms to make sure that inspectors will keep inspecting and monitoring using the same standard procedures, especially with the aim to prepare for newcoming norm, EurepGAP. There were so many standards for agricultural products: - Organic farming certification system consists of EC reg.2092/91 (European Union), IFOAM (International), NOP (USA), JAS (Japan), etc. and most have differences in details, even though they are in the same conceptual framework of organic farming, - HACCP are more concentrate on conducting hazard analysis, identifying critical control points (CCP) in analysing physical, chemical, biological properties and ensuring the hygiene in all the food-related activities, - EurepGAP for fresh fruit and vegetables has the same concept with HACCP but its scope is at the farm level. There are control systems by farmer training, internal inspectors, external inspectors and auditors. - Etc. During training period, there were discussions and experience sharing among attendees to clarify all questions and doubts and to eqaulize the knowledge base of every attendee. Finally, this event is aimed at enlarging the linkage among international inspectors and stakeholders in organic and quality food area which will be benefit for international trade in the near future. Two members of the BEAN-QUORUM network participated to the training program activities: Huliyeti Hasimu (XJAU & UniBO) and Rungsaran Wongprawmas (Tham).